V is for village, Vinette, Venango, value and volunteer. Volunteers and value go together when you refer to the incredible crew of volunteers in the Section of Archaeology at The State Museum. Our dedicated crew ranges in age from sixteen to sixty plus and bring a wide array of skills with them. We currently have fifteen volunteers that assist us in the lab area of the Section and an additional twenty some volunteers for our field excavations and public programs. Volunteers contributed just less than nine-hundred and fifty hours to the Section for the period of January thru June 30th of this year. Put that in terms of a 7.5 hour day and you have 127 days of labor. We have a very small staff here and this contribution to our program is amazing. 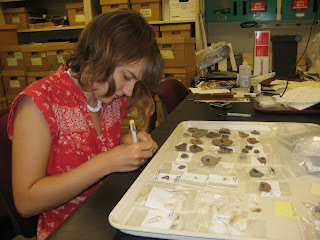 Volunteers help with recording site bags/tags, sorting artifacts, washing artifacts, labeling, data entry, mapping and the list goes on and on. 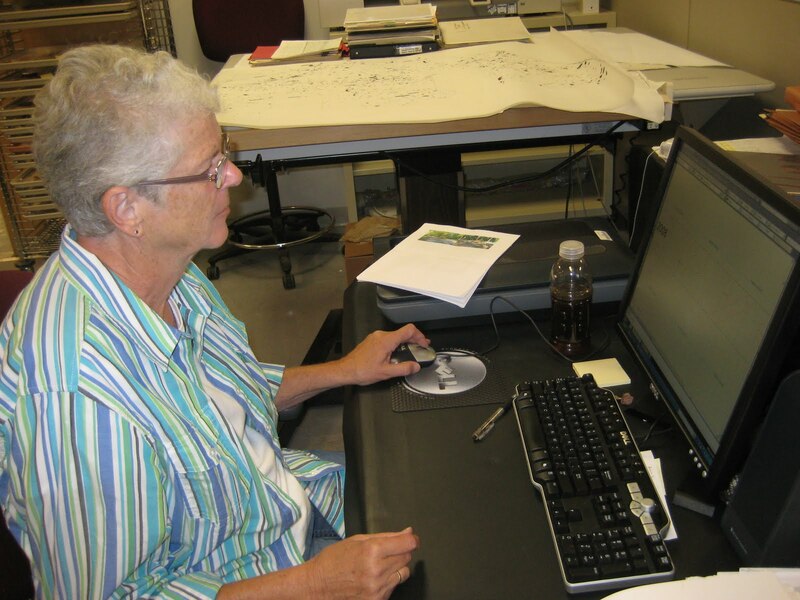 They help us organize the file documentation for archaeological projects, scan slides and photographs into digital formats, rehouse collections into archivally stable materials, organize the many manuscripts and reports generated with archaeological investigations and generally help in whatever task we need. These are all projects that occur in the lab, we still have the volunteers that help us with programming and field work. In the field our volunteers have shown us the merits of shop vac’s on cleaning up units for photographs, provided survey skills, taken photographs, skillfully drawn and recorded profiles and features. Our volunteers bring such enthusiasm to the shaker screens that we are assured that every artifact will be scoped out and recovered. They are careful and thorough at excavating archaeological sites and often offer a different perspective when we are attempting to identify artifacts. Their wide array of skill sets come from their diverse life experiences. We can count retired school teachers, engineering technicians, office managers, secretaries, and students in our circle of volunteers. We often encounter folks that say they always wanted to be an archaeologist, but never had the opportunity. We encourage them to come visit us at our public excavation at Fort Hunter or come into our lab and spend some time with us. This is how many of our volunteers have come to us. Many folks that thought they would like archaeology found out that they didn’t like the tedious, less glamorous tasks that come with the profession. We have been fortunate to have a core group of dedicated volunteers that have seen us through a building move, multiple personnel changes, and several computer upgrades. Our newest volunteer has just been with us a few weeks and our longest term is sixteen years. Pretty impressive! Please join us this week in recognizing and celebrating the letter V and our Valuable Volunteers. U is for Underwater Archaeology, because frankly Underground Archaeology is just a little too redundant, kind of like wet water, or hot fire. Underwater archaeology poses a unique set of challenges to an archaeologist. Changing conditions on the water, delicate precision instruments, and a specialized skill set necessary to use them, make underwater archaeology not only a costly proposition but a potentially hazardous one as well. 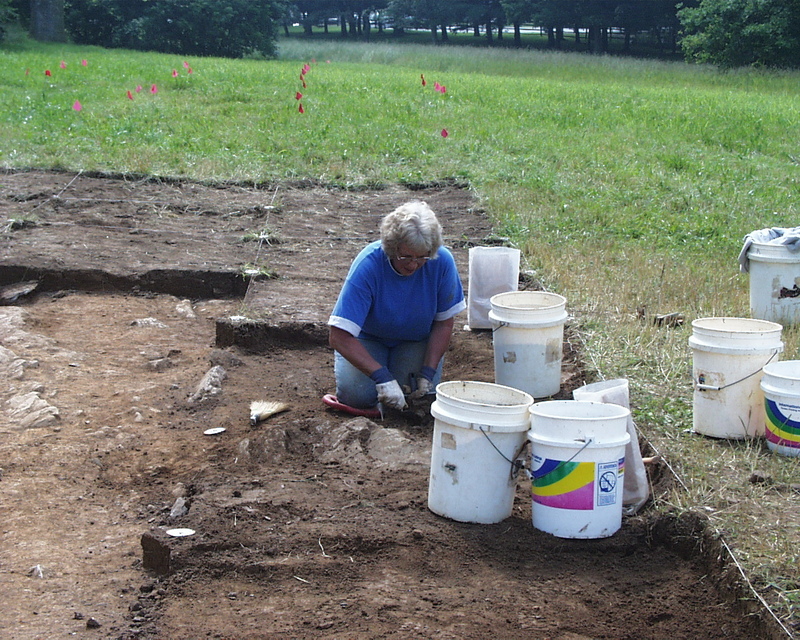 Not surprisingly, it’s not very often underwater archaeology is conducted in Pennsylvania. Nevertheless, there are a few notable examples where it has taken place. One artifact collection recently submitted to the State Museum of PA involved an underwater survey of a small portion the Delaware River in anticipation of a runway expansion at the Philadelphia International Airport. Ground penetrating radar and sonar surveys were used to identify areas of interest or “targets” that were later visually inspected with the aid of SCUBA gear. 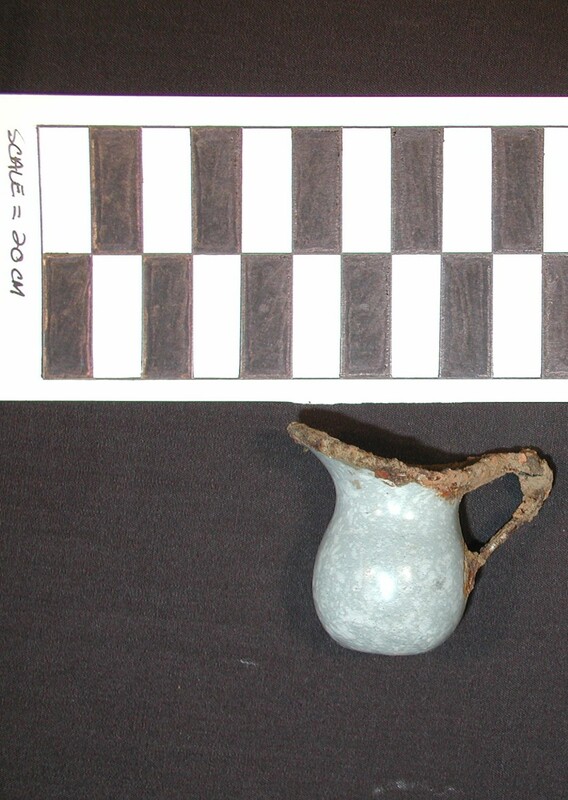 Seen below is a sample of artifacts recovered from the underwater excavation. earthenware ceramic sherds, dark green glass wine bottle fragment, iron spike, and stoneware bottle c. mid 19th C.
In his manuscript A Preliminary Survey to Analyze the Potential Presence of Submerged Cultural Resources in the Delaware and Susquehanna Rivers J. Lee Cox Jr. lists over 100 shipwrecks on the Delaware River between 1757 and 1946. Schooners, sloops, tugs and steamers, with names like Mosquito, Yankee Doodle and Sturdy Beggar, succumb to watery graves from collisions with other vessels, boiler explosions, deck fires and crushing winter ice. One spectacular artifact recovered from the Delaware River in 2007 can be traced back to the Revolutionary War. 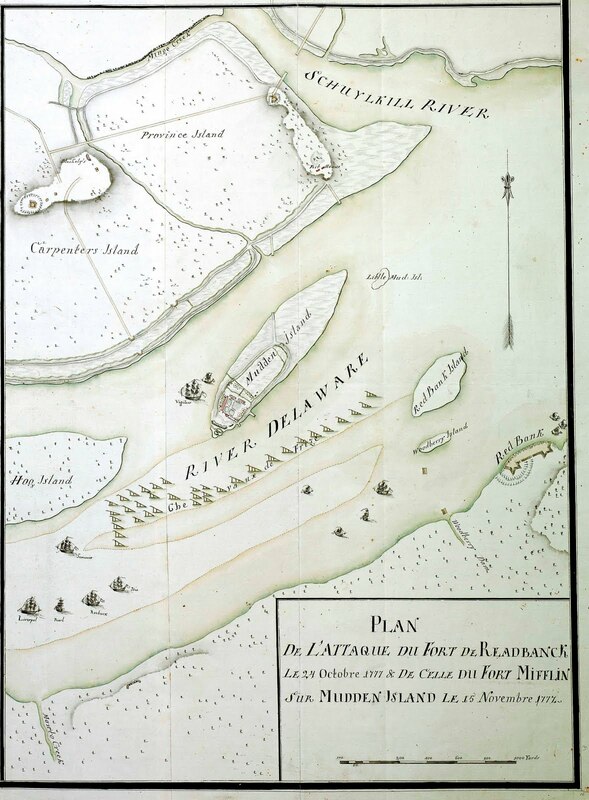 A cheval de frise, intentionally submerged to obstruct British naval forces from advancing up river, was found in remarkable condition and can be seen at the Independence Seaport Museum, in Philadelphia. 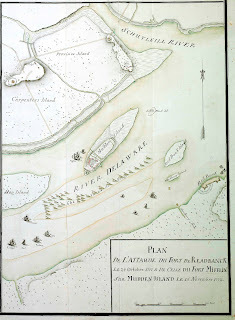 The map above illustrates the position of the defensive cheval de frise in the Delaware in 1777. Moving to the opposite corner of the State, this Snead shallow water diving helmet was recovered off of Presque Isle in Lake Erie, and was donated to the State Museum of PA by John Cutter in 2005. Cast iron in construction, weighing around 60 lbs it dates between 1900 and 1940 and is truly a one of a kind object in the collections of the Section of Archaeology. Not known to be associated with any shipwreck, the helmet is currently on loan to the Erie Maritime Museum. While the notion of searching for sunken treasure has a certain appeal to the adventurer and the romantic alike, it is important to note that that objects recovered from waterways within the state are subject to the State History Code and in fact the property of the Commonwealth. This week the letter T takes its turn in the alphabet cycle and we’re going to take a trip through time with Toys. Toys come in many forms and their function is often thought of as purely entertainment, but in reality toys are an important tool in the development of our cultures. Social skills develop from interaction with others while playing games such as dominoes or marbles. Toys which aid in teaching a skill or lesson are educational, and yet other toys serve to stimulate creativity and independent thought. Toys in the archaeological record generally represent a group that is often left out of the historic record, and barely evidenced in prehistory. Children constitute this silent group. This week we are going to examine a few of the toys in our collection and look at how those toys aid and influence childhood development. As previously stated the presence of children in the prehistoric record is often difficult to identify. Early cultures were likely very nurturing of their children due to high infant mortality rates, but anthropologists believe that children who survived infancy were assigned chores at an early age. Our first example is a small clay pinch pot made by a child, possibly a girl learning to make clay pottery. 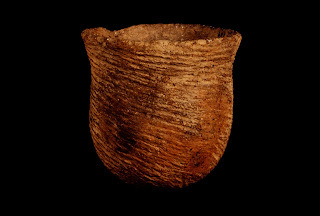 Archaeologists often refer to these as “toy pots” because of their crude construction and childlike qualities. Women were likely responsible for making clay pots for cooking and storage, as men assumed the role of hunters who would travel seasonally large distances from the village. If women were making pottery and caring for young children, it is likely that involvement in the task of making pottery developed at an early age. While this could be considered an educational toy, it also lends itself to creative thought. Our next example is a toy, but also a skill builder. The cup and pin game taught patience and hand-eye coordination. Accuracy and mental alertness were important skills for hunting and fishing and the social interaction was important in building trust, all necessary tools for survival. The elements of this game are simple and were readily available on prehistoric sites. Animal bones, usually deer or caribou toe bones were hollowed out and strung on cordage with a bone or wood pin at the other end. A piece of leather or fur at the other end of the cordage provided weight. Holding the pin the player would swing the bones up and try to insert the pin through the center of the hollowed bones. Points were scored based on which bone was caught on the pin. This traditional game is still played in various forms by Native peoples today. Marbles are another example of a simple element which requires accuracy, practice and skill. While our previous blog traced the changes over time in the marble form, our focus here is on the social play and skill developed from the game. Marbles did not require an organized team with uniforms and special playing fields. It was a “pick-up” game something easily transported and readily played amongst a group on any flat surface. To state that it is a simple game might not be accurate if you are a gamer, proficient in the lingo and spot on with a shooter. The nature of the game allowed for play at an early age, but did not limit itself to youth as archaeologically marbles have been found in concentrations in industrial settings as well. Marbles have evolved from merely a social game into marble collecting and of course, to a modern hand held version for your iphone. Late 19th/20th Century marbles from 36Er241, Fuhrman House Site excavated for the Lake View Landfill Project by Wilbur Smith Associates. Some toys are often identified as gender specific, an example of this is a doll. Anthropologists have studied the social interaction of children with toys for decades and the debate lingers as to what is learned behavior based on influences from society and what is actually biological choice in what a child plays with. The maternal or paternal instinct that is derived from playing with dolls is an example of a toy that is also a teaching tool. 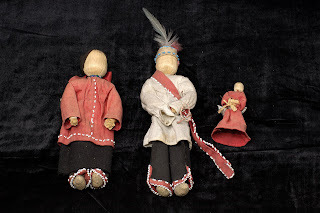 Our society often taboos boys playing with dolls as child rearing is traditionally viewed as a role performed by women. However, our society is changing. As more women enter the workplace and more men either by choice or necessity are responsible for child care, the doll has evolved from a fairly simple toy for learning nurturing skills to a learning tool for anything from infant CPR to a pregnancy prevention tool. Dolls are also a form of creative play and children play with dressing dolls in various clothes or fashioning the doll’s hair in new styles. The clothes that dolls are dressed in are a reflection of the culture surrounding them. Children are often presented with dolls in native costumes representing various foreign countries. This is often a child’s first exposure to foreign cultures. These cornhusk dolls are dressed in traditional native dress and are examples of dolls dressed to represent various cultures. Obviously the doll is a learning tool, but instead of its focus on nurturing, it is now functioning to make society more accepting of diversity. 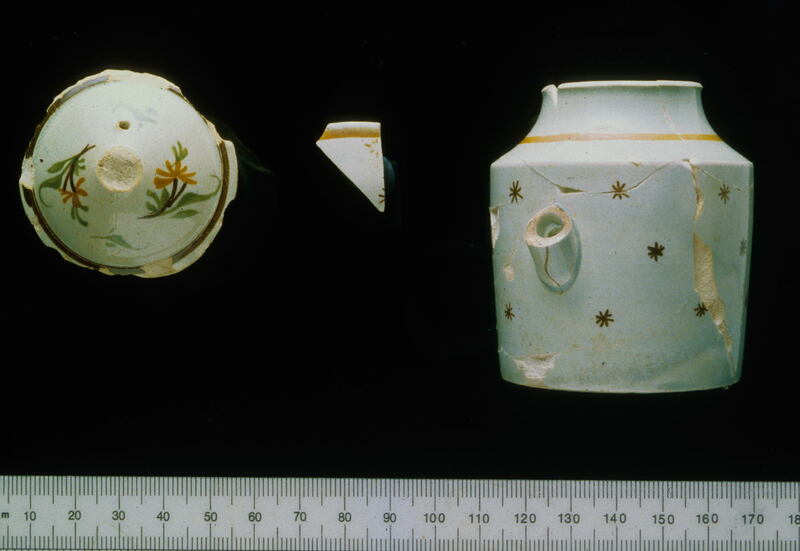 Children’s dishes and toy tableware are often recovered on archaeological sites. During the Victorian Era manufactured toys are more prevalent and toys become more finished and reformed, often losing some of the creative play elements necessary with early toys. This was especially true of fancy table wares produced in miniature for children to replicate adult tableware of the era. Wealthy families could purchase these elaborate table wares for their children, while the poorer children of this era played with wooden blocks and cloth dolls. It is during the late 19th and 20th centuries that elaborate table settings are manufactured and the etiquette of table manners develops. So while these children’s sets were for enjoyment, they were subtly teaching table manners and etiquette to children. Increased productivity in manufacturing allowed for more children to play with these miniature sets of table ware, but also decreased the size and quality of the toy. Moving thru the 21st century in our journey thru toys brings the introduction of a new material for manufactured toys- plastic. With the development of plastic, toy manufacturing explodes and a multi-billion dollar industry is born. Toys evolve from simple forms often hand crafted from available products, to massively produced toys attainable in any number of ways. Toys become inserts in cereal and Cracker Jack boxes, treats at the dentist for good oral hygiene and give-a-ways at bank and shopping center promotions. Books and comics based on fictionalized characters provided manufacturers yet another avenue of marketing for toys. Movies based on these characters added to the demand for whistles, glasses, toy guns, cars, planes and the list goes on. This mass distribution of toys allows for a greater influence on society by toy manufacturers and a broader populous. Secondary to this mass production is the desire to collect toys for monetary or sentimental reasons. The popularity of mass produced toys amongst adults and children will make our jobs more difficult in the future as archaeologists search for evidence of children in the archaeological record of a site. We hope you’ve enjoyed this trip through toy time and just maybe for a fleeting moment we've stirred a favorite childhood memory of your very own. Adorning the human body with ornaments has a long history throughout the world. Here in Pennsylvania, however, shell objects generally appear in archaeological contexts of the Late Woodland and Contact eras. While shells represent a plethora of different types their common use appears to have been in the manufacture of pendants, necklaces, bracelets, or less frequently as patterned designs attached to clothing. Beginning around AD.1050 people of the Monongahela, Shenks Ferry and Susquehannock cultures of the Upper Ohio and Lower Susquehanna valleys used variously shaped shell objects as personal items of adornment. Typically, marine shells from the eastern seaboard, and others possibly from the Gulf of Mexico, were traded into southern Pennsylvania and other regions of the Northeast and Middle Atlantic where these Native American groups once lived. Listing the species of marine shells traded were Busycon (various species) commonly referred to as “conch shell”, Littorina spp. (Periwinkle), Mercenaria mercenaria (Hard- Shell Clam, Quahog), Crassostrea verginica (Eastern Oyster), Marginella spp., (marginella shells), Olivella spp., olive shells, among others. Freshwater shells found in most of the rivers and larger streams of Pennsylvania were collected and made into tiny disc-shaped beads that were worn around the necks and wrists of individuals. 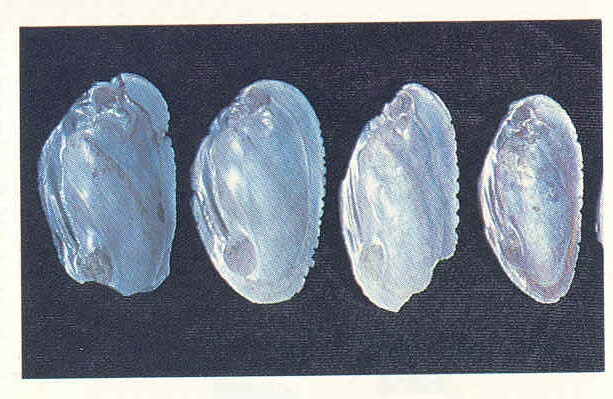 Pieces of the freshwater shell Elliptio spp. were fashioned into oval-shaped pendants and suspended, singularly or in groups, around the neck and waist sometimes accompanying small wafer thin disk- shaped beads no larger than a half centimeter (roughly 3/8 inch) in diameter. Wampum-peag or seewan was the main material of barter among many American Indian groups. 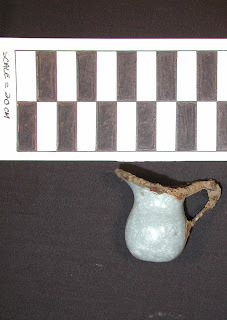 The small barrel shaped pieces of wampum were difficult to manufacture using native made tools, however, the task became much less burdensome with the arrival of European iron tools. Peace belts and small strings of wampum were used on special occasions such as the Requickening Address, one of two of the morning rituals performed during the Condolence ceremony. To this day the ritual is performed after a person’s death, by Iroquoian groups in New York and on the Grand River reservation in Canada. The colors of wampum include white, gray, purple and black. The purples and blacks were more desirable depending on the individual’s preference. Variously colored wampum was incorporated into designs commemorating specific events such as Penn’s Treaty with the Indians. Shell was also an important material as a temper medium to make Monongahela and Susquehannock pottery. Throughout the Monongahela and Susquehannock continua shell tempered pottery was the main ware used for the daily preparation of cooked foods. We know this by the presence of organic residues remaining on the insides of pots where the food was exposed to high heat. 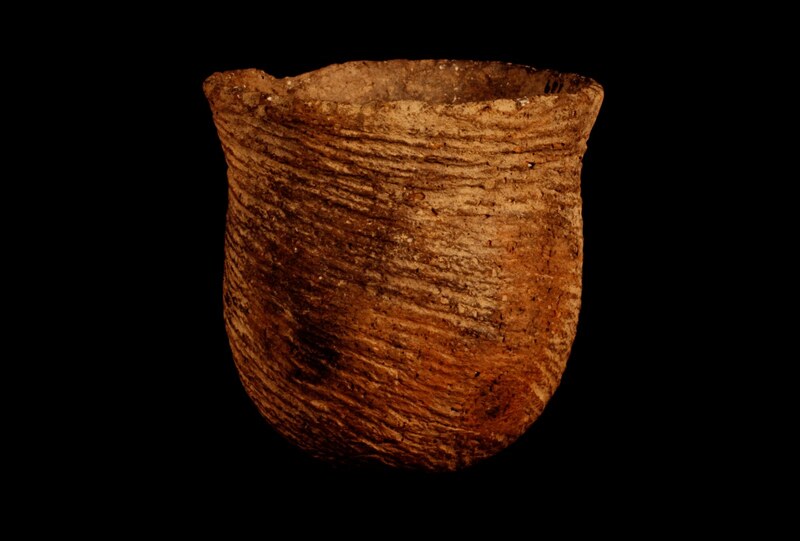 Analyses of charred pot residues from sites in New York show that corn was one of the foods boiled and consumed by prehistoric Native Americans. The more massive size pots were typically used for storing dried foods while the insides of smaller size vessels were sealed with animal fat or other appropriate materials and used to carry water. Unmodified shells collected directly from their watery environments made excellent hand-held digging tools that the Indians used during the late spring planting season. There were other occasions when shells became useful materials in tool making. such as when the Monongahela Indians modified freshwater shells (Unio family) into saw toothed cutting tools for rendering and processing plant and meat foods. Such tools were also used to press a dentate-like design onto the rims of pottery and smoking pipes to give them an artful appearance. So, when you find a shell at the beach this summer or when simply spending some leisure time hiking along the river’s edge, remember how they might have been utilized by, and how important they were to, the Late Woodland Indians.